An ongoing lack of butter in Norwegian stores has sparked new calls for the country’s powerful dairy cooperative Tine to be broken up. One professor decried Tine’s “near monopoly” on the market for butter in Norway, while others bashed its “unlimited arrogance.” Tine’s own dairy farmers are critical, too, while irritation keeps rising among consumers. That’s what Arne Nygaard, a professor at BI Norwegian Business School, is calling Tine as well. He points out that Tine controls more than 90 percent of the market for butter in Norway, and their dominant role is unfortunate for consumers. “Tine is much too large in the market,” Nygaard told NRK on Thursday, shortly after Tine officials admitted that they were even having trouble importing butter after finally, as so-called “market regulator” in Norway, asking state authorities to lower or eliminate tariffs and fees controlling production and imports. Nygaard, who specializes in retailing and marketing at one of Norway’s top business colleges, claimed that Tine as a “monopoly” is bureaucratic with a “heavy” organization that’s set in its ways. He also said on national radio Thursday morning that Tine is not very market-oriented or customer-oriented. “That’s characteristic of such monopolies,” he said. He proposes breaking Tine up into several different companies that should compete against each other. Otherwise Tine will continue to be allowed to pretty much decide what Norwegian consumers are allowed to buy, and at what price. The company earlier has ranked high in consumer confidence polls, but court battles over alleged attempts to hinder smaller producers like Synnøve Finden and Q-dairies have marred its image in recent years, while more globally oriented consumers want more choices. Several dairy farmers supplying the milk needed for butter-making already have complained that Tine waited much too long to address the looming butter shortage, probably because it’s by its nature reluctant to open the borders to competition from foreign imports. Now that it has, if only for butter, Tine has only managed to acquire 40 tons of butter from foreign sources, claiming that butter inventory is also low elsewhere in Europe. 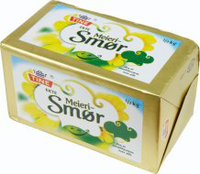 Meanwhile, though, Tine’s only sizable rival Synnøve Finden has managed to acquire several hundred tons of Belgian butter, which is expected to start appearing on Norwegian grocery shelves soon, possibly even by tomorrow. Synnøve Finden appears likely to emerge from the butter crisis in Norway as a much more consumer-friendly producer than Tine, especially since butter normally isn’t in its product line apart from the special spiced butters that it makes. The tidal wave of criticism against Tine should make its officials nervous at the very least, although communications director Elisabeth Morthen continues to blame the lower production and higher demand than her colleagues foresaw. “I can’t see that breaking up Tine would have helped in the situation we are now in,” she told NRK on Thursday. Tine’s chief executive Hanne Refsholt for the past seven years, meanwhile, has been completely absent during the butter crisis. As DN reported earlier this autumn, she’s taken a leave of absence for a full year at full pay, to recharge batteries and study management issues at schools in Paris and Oxford.